A Japanese H-IIB rocket carrying the HTV-7 cargo ship (Kounotori7) for the Japan Aerospace Exploration Agency stands atop its launchpad at the Tanegashima Space Center in southern Japan. Liftoff is scheduled for 1:52 p.m. EDT on Sept. 22, 2018. A Japanese cargo spacecraft is scheduled to launch toward the International Space Station (ISS) today (Sept. 22), and you can watch the action live. 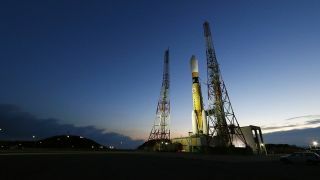 The robotic HTV-7 cargo ship will lift off atop an H-II rocket from Japan's Tanegashima Space Center at 1:52 p.m. EDT (1752 GMT; 2:52 a.m. on Sept. 23 Japan standard time), if all goes according to plan. You can watch the launch live here at Space.com, courtesy of NASA TV. Today's liftoff was originally scheduled for Sept. 10 but has been pushed back several times for several different reasons — Typhoon Mangkhut affecting a key tracking station on Guam, bad weather around Tanegashima and an issue with the H-II rocket. "HTV" stands for "H-II Transfer Vehicle." The cargo craft is also known as Kounotori, which means "white stork" in Japanese. HTV-7 will be, as you may have surmised, the seventh HTV mission to launch toward the orbiting lab. The HTV is one of four robotic cargo spacecraft that service the ISS. The other three are Russia's Progress vehicle, the Cygnus spacecraft built by American company Northrop Grumman and SpaceX's Dragon capsule. Dragon is the only one of the four that makes it back to Earth in one piece; the other three are designed to burn up in the planet's atmosphere.